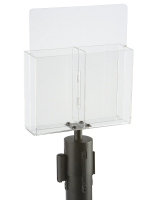 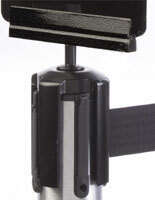 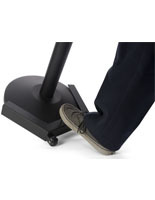 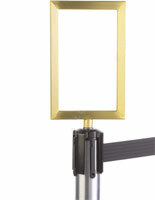 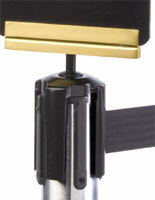 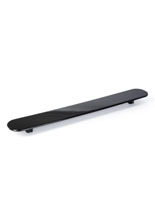 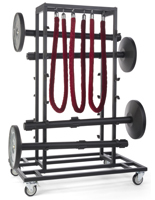 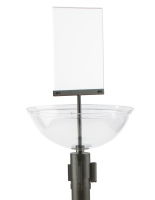 Can stanchion sign holder accessories help make your tension barricade system more efficient? 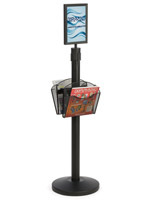 Our Economy and Tensabarrier® lines offer a wide variety of queuing solutions that are easily customized to accommodate different uses. 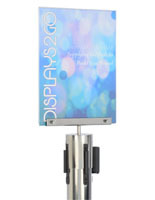 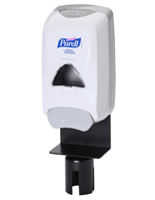 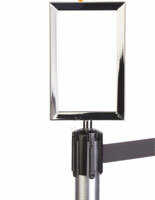 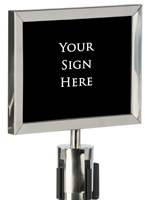 Our easy-mounting stanchion sign holder accessories include frames and grips for sign panels and custom or stock signage holders. 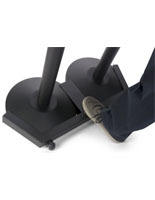 In addition, storage and transportation devices specifically designed for retractable belt guidance make it easy to set up and take down multiple stand installations in a matter of minutes. 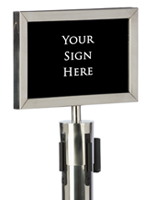 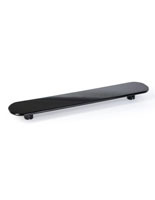 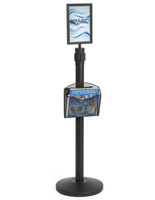 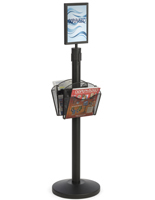 These types of versatile stanchion sign holder accessories, also known as crowd control tools, are also ideal for providing customers with simple directions or wayfinding information that can make the difference between a patient customer or a dissatisfied former patron. 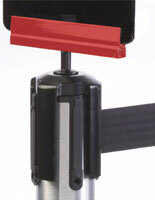 Barrier and belt queuing arrangements are more than just portable dividers to direct or contain traffic. 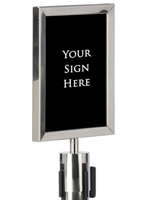 Adding communication and wayfinding signage can have a positive impact on customer satisfaction. 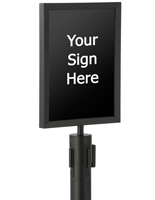 How do add-on options work with common crowd control tools? 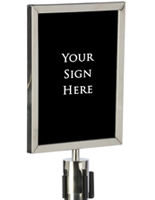 Stanchion sign holder accessories, particularly high-visibility signage fixtures, are easily incorporated into existing configurations. 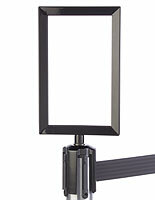 Stands for retractable belt barriers allow frame adapters to attach easily to the aluminum or steel moveable units. 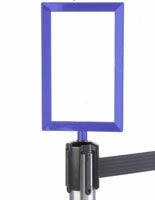 Durable plastic brackets with built-in framing holders simply snap onto the tops of line or end posts of retractable belt poles. 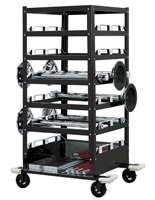 Wheeled carts enable entire portable fencing or palisade configurations to be moved quickly between locations with minimal damage or effort. 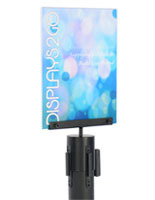 Even printed merchandising enclosure systems such as café banners can have additional messaging easily attached using these simple frame mounts for maximum communication with customers. Barriers allow businesses to direct the flow of customer traffic as needed. 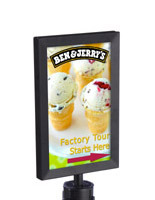 Top-mounting aluminum framed signage accessories, however, can do much more than simply provide wayfinding information to point customers to particular services. 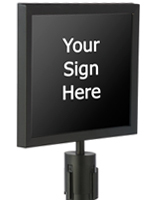 Businesses and organizations frequently find that this type of subtle messaging is also effective for up-selling, cross-selling and other merchandising purposes. 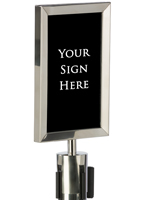 Many commercial locations using retractable belt crowd control tools such as aluminum or steel-base configurations choose to use on-post signage as an opportunity to open a dialogue of sorts with clients before they even reach a representative. 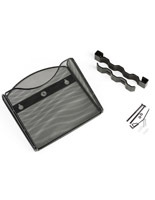 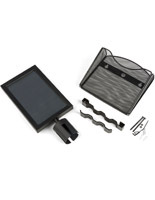 Where and how can these accessories best be used? 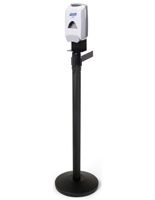 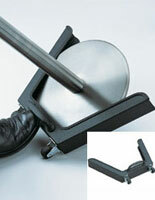 Commercial grade crowd control tools often serve to designate queuing areas to customers based on service requirements. 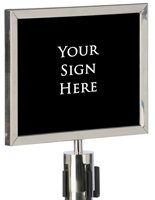 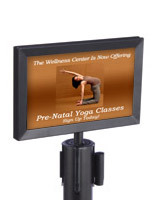 An end-post frame for a "Customer Service Line Forms Here" sign could easily be augmented by mounting informational custom plastic signs for Membership opportunities, Special Sale information and even digital contact information such as web addresses on interior stands. 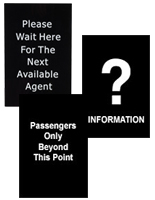 Larger commercial operations with heavy traffic, such as transportation terminals, concourses and arenas frequently have multiple customer service lines that specialize in different areas. 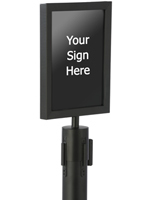 Gripper brackets allow fast, convenient and safe sign changes to allow signage to match service needs. 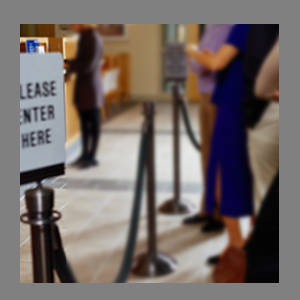 Separating patrons into "Will-call," "Cash" and "Credit Card Transactions" can easily increase the speed at which lines move, which translates directly into more satisfied customers. 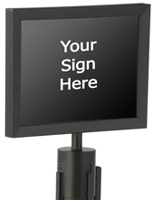 Other businesses may find it more convenient to use in-line signage mounting to provide specific directions to assist customers in getting through long lines with minimal delay. 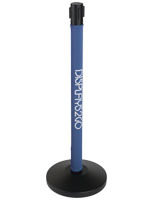 Stanchion add-ons for plastic signs informing customers that food or drinks are not allowed inside a venue, that minors are not permitted into a venue, or even that hard-copy tickets are required for admittance can all ensure that patrons are prepared when they reach entry or exit points. 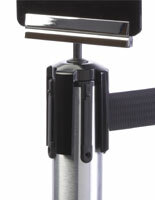 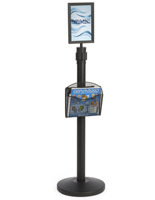 Stanchion add-ons that make it easier to utilize retractable belt stands and steel or aluminum barricade systems as a whole are also valuable business accessories. 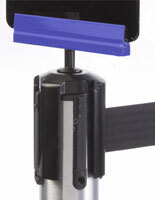 While any non-fixed position units are considered "portable," the weighted bases with plastic belt cartridges can make it difficult and time-consuming to reposition more than one model at a time. 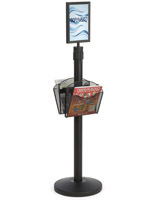 Our heavy duty wheeled cart is a perfect way to move multiple fixtures and signs quickly and efficiently. 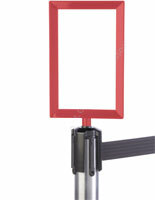 Base posts load easily into padded shelves, reducing the chance of damage.